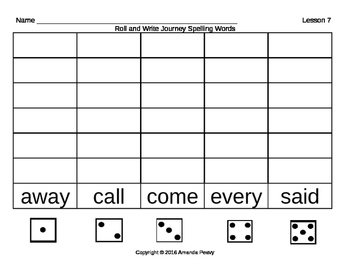 This activity goes along with the spelling list I created to go along with our Journeys basal reader (30 units). 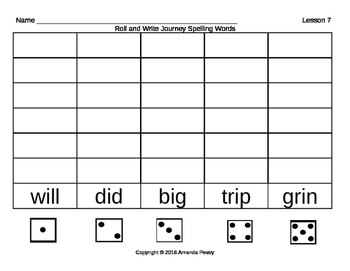 You can purchase this list on TPT under "First Grade Journeys Spelling/Sight Word Lists." I recommend that you copy these pages on cardstock or construction paper and laminate them so they may be reused. I change these out each week at my "Word Work Center" to go along with our Journeys basal reader. Students must roll a dice and write the corresponding spelling word. They play until they reach the top of one of the columns. They can compete against themselves or a partner. So simple, but my students love it! By the end of the week they definitely know their spelling words. You can purchase several other activities to go along with this list in my store including ABC Order, Word Work, Sight Word Games, Scrabble Math, etc.